The Vidpro LED-330 Studio Video Light features the latest SMD technology (surface mounted device) LEDs. These flatter LEDs are designed to be lighter and slimmer resulting in a video light which is more portable than traditional LED video lights while offering superior power and performance. 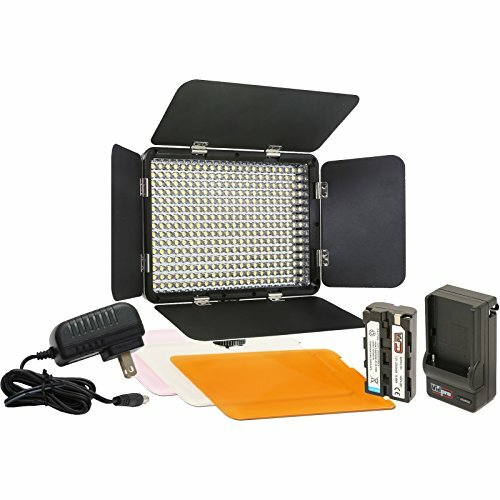 The LED-330 has an adjustable step-less dimmer for 10-100% brightness control, two detachable 3200K, 4300K filter gels for warm lighting and a detachable soft diffuser to better distribute the light and help eliminate shadows. Plus, since LEDs give off very little heat, your subjects will be more comfortable during long shooting sessions. The built-in barn doors makes aiming your light quick and easy and will attach to any camera or camcorder with a hot shoe.